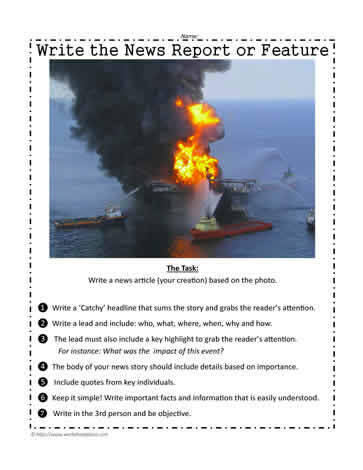 Write a news report based on the photograph. Write a news article (your creation) based on the photo. ❶ Write a Catchy headline that sums the story and grabs the reader?s attention. ❷ Write a lead and include: who, what, where, when, why and how. ❸ The lead must also include a key highlight to grab the reader?s attention. For instance: What was the impact of this event? ❹ The body of your news story should include details based on importance. ❺ Include quotes from key individuals. ❻ Keep it simple! Write important facts and information that is easily understood. ❼ Write in the 3rd person and be objective.